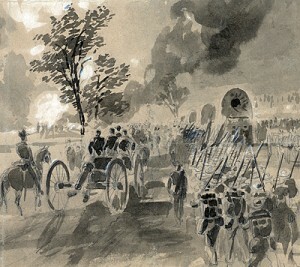 The Battle of Gaines’ Mill took place on June 27, 1862 in Hanover County, Virginia and was the third of the Seven Days’ Battles and its largest engagement. After the battle of Beaver Dam Creek, Union Major General George B. McClellan determined to change his base to the James River in order to protect his Army of the Potomac from what he felt was a much superior Confederate Army. Confederate General Robert E. Lee unleashed a relentless attack against Union Brigadier General Fitz John Porter throughout the day. McClellan driven by fear and indecision was convinced that his Union Army was vastly outnumbered and failed to provide adequate reinforcements for Porter’s V Corps. As the battle raged, the Confederate Army awaited the arrival of Major General Stonewall Jackson to turn the tide in the battle. Jackson arrived later than Lee expected which proved costly for the Confederate soldiers. By the time Lee executed his all out attack on the Union Army with Jackson present, it was 7 P.M. and darkness was approaching. The Civil War Preservation Trust website provides a wealth of information on the battle including images, maps, recommended readings, online resources and scholarly articles. The Official Virginia Civil War Battlefield Guide by John S. Salmon is partially available on Google Books and offers a clear overview of the battle with maps and gives directions and information for visiting the battlefield. One of best reviewed and definitive accounts of the battle is featured in Stephen W. Sears’ To the Gates of Richmond: The Peninsula Campaign. For primary accounts from both sides, consult volume 11 of the Official Records.